For basketball fans, what better way to kick off Thanksgiving weekend than with the Concordia Classic tournament? Teams from all over Canada, including Regina, Newfoundland and P.E.I. came to participate. Both the men’s and women’s Concordia Stingers won the tournament. The women’s team won all three of their games, while the men had a 2-1 record before Anthony Sanogo’s buzzer-beater in their final game captured the tournament win. The women’s team opened the tournament against the Memorial University Seahawks on Oct. 5. They jumped out of the gate, starting the quarter with tenacious defence, allowing only one field goal in the opening six minutes of play. Combined with their ball movement, tenacious rebounding and fast break attack, the Stingers built a 15-point lead after the first quarter. The second quarter remained the same as Concordia built on their first-quarter success. They extended their advantage to an 18-point lead with a 37-19 score at halftime. Rookie point guard Myriam Leclerc won the tournament MVP. Photo by Gabe Chevalier. Halfway through the third quarter, the Stingers took a 24-point lead, forcing the Seahawks to call a timeout. Memorial began to find their footing as their defence forced the Stingers’s ball movement and fast break offence into stagnant half court sets. Memorial shot 50 per cent from the field in the third. Led by the game-leading scorer Sydney Stewart, she finished the third quarter on a three-point play to bring the Seahawks within 11 points. The fourth quarter was the lowest-scoring quarter of the game as both teams struggled to create offence. 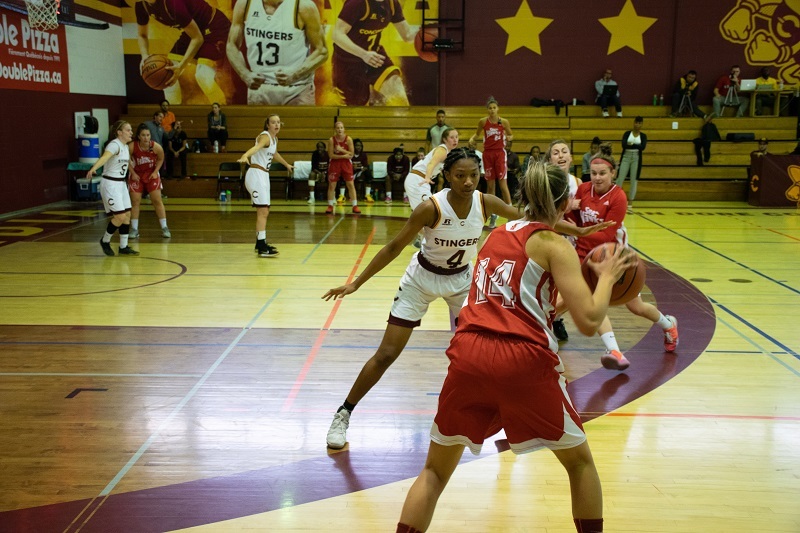 Stingers guards Myriam Leclerc and Coralie Dumont scored 10 of the team’s 12 fourth-quarter points to hold off the Seahawks’s late rally, and hold on to a 71-58 victory. The men played the Regina Rams on opening night, winning 82-63. The game was more competitive than the final score indicates. The tone was set in the first quarter by Stingers guard Adrian Armstrong, who made his first three attempts from beyond the three-point line. The Stingers connected on 5/12 from three-point range in the first, leading to their highest-scoring quarter of the game and an early 10-point lead. Halfway through the second, the Stingers had a 14-point lead, but Regina’s full-court press began giving the Stingers problems. Turnovers became the story of the second quarter, as the Stingers gave up the ball six times compared to the Rams’s two. Regina had cut the host’s lead to six, but Sanogo came off the bench to score seven points in the quarter, giving the Stingers a 40-31 lead at halftime. Regina cut the lead to five points with a bucket and an assist by Myles Hamilton in the third quarter. Armstrong continued to not only shoot the ball well, but also create plays for his teammates. By the end of the third, Concordia outscored Regina by eight to take a 17-point lead. The fourth quarter was more of the same, with Regina unable to cut the lead under 10. With two double-digit scorers and five other players scoring at least eight points, the Stingers held on for an impressive 19-point victory. Stingers head coach Rastko Popovic praised his team’s resilience as they dealt with injuries to three of their starters.